A skate, according to Mr. Webster, is a contrivance for the foot, consisting of a keel-like runner attached to a plate or frame, enabling the wearer to glide rapidly over the ice. This definition, good enough so far as it goes, is, in the light of recent developments, plainly deficient. 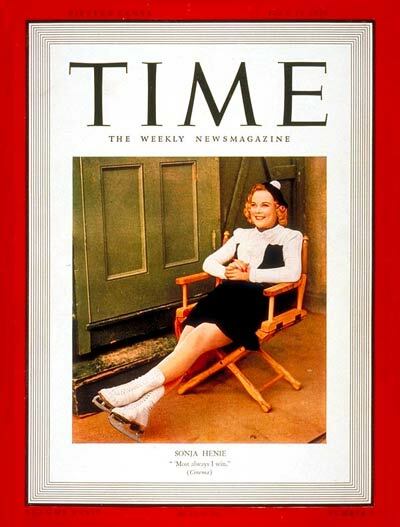 It is evidence that the times move faster than the dictionary, and that the dictionary is not yet aware of Sonja Henie. For this blood daughter of the Norse has during recent months demonstrated unmistakably that a skate is something more than what Mr. Webster’ says it is. To her it has proved the means to fame, fortune, movie stardom and the plaudits of kings. With it she has glided swiftly not merely over the ice, but also into one of the most extraordinary of all motion picture careers. J.D. Shapiro of Arkansas Gazette, January 23, 1938 had an opportunity to interview Sonja Henie, a retired figure skater whose three straight Olympic gold medals and ten straight world championships in individual figure skating propelled her to the heights of Hollywood. Henie would leverage her sporting accomplishments and become one of the most famous people on the planet in the 1930s and 1940s, a movie and professional skating star, who earned millions of dollars in the process. At the time of the interview, Henie’s third feature film – “Happy Landing” – was about to debut, and she was about to leave with 80 other skaters on a lucrative national tour of her own ice skating show, called the “Hollywood Ice Revues.” Thanks to her first two films, Henie had already earned hundreds of thousands of dollars. Her first film “One in a Million,” had already made 20th Century Fox more money than any of its other films released in 1936, while her second film, “Thin Ice,” was the fifth biggest box office hit of 1937. According to the Shapiro interview, skating stardom and Hollywood famedom was the goal all along. “I said to myself,” she explains, “I’ll win 10 skating championships, then I will go into the movies,” She won the championships. Now she is in the movies. So what is strange about it? Sonja it seems has always been like that. She usually knew what she wanted. She usually go it. At seven years old, she told us recently, she wanted a pair of skates for Christmas. Her parents didn’t want to give them to her because they thought she was too young, but in the end she got them. Soon she wanted to win a Norwegian championship. She did, at 11. Next she fastened her eye on a world championships, and she got it, at 14. After that she decided to triumph in the Olympics, and nothing could stop her. And when it came to the world of film, she targeted 20th Century Fox, led by Darryl F. Zanuck, who according to this Vanity Fair article, had a nose for talent outside the acting world and was willing to take a chance on non-conventional ideas and people. 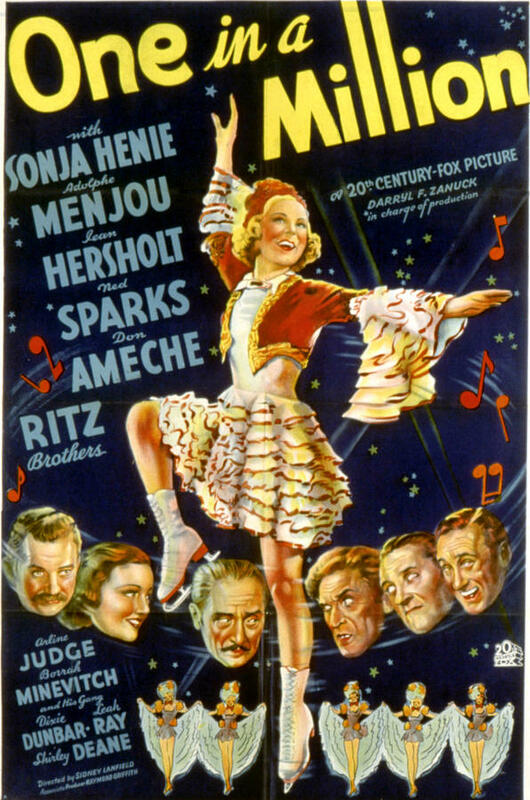 Henie’s business partner, Arthur Wirtz, who created the ice revue business for Henie in New York, would help Henie bring an ice show to Hollywood with the hopes of getting the studio heads’ attention. Sonja’s father, Wilhelm, then went to see media mogul, William Randolph Hearst with an offer – the Henie’s would donate $5,000 to a charity of Hearst’s choice if his mistress and actress, Marion Davies, would sponsor Sonja’s ice shows. They agreed, and two shows were produced, and the stars came out to the spectacle: Mary Pickford, Douglas Fairbanks, Spencer Tracy, Clark Gable and Myrna Loy – Hollywood royalty of the time. And at the second show, Zanuck showed up. According to Shapiro, Zanuck signed Henie to a five-year contract, instantly making her one of the highest paid actresses of her time. At the release of her first picture, “One in a Million”, Sonja Henie, walked arm in arm with Hollywood leading man, Tyrone Power at the film’s premier at the Roxy Theater in New York City. The one-and-a-half meter tall woman from Oslo, Norway was a giant of giants. Here is Sonya Henie in Fly on Ice, her last theatrical film in 1958. P&G’s long-running series of “Thank You Mom” commercials have been a powerful testament to the importance of the love and support of parents, particularly mothers. The global consumer goods company has worked hard to make the connection to caring mothers and their brand, and have leveraged sports stories during Olympic cycles to send particularly emotional messages. Their most recent commercial, “Love Over Bias,” has – at least to me – a more intense resonance. These are divisive times, with tensions emerging out of the economic dislocations that have slammed the middle classes in developed economies all over the world. The tensions have at times, in my view, manifested themselves in balder declarations of intolerance, in angrier expressions of victimization, and more frequent impulses to violence. The message is that children at times suffer unnecessarily from bias, whether they are black with hopes of making it in a sport dominated by whites, or boys in a sport where boys’ sexuality are questioned, or children who have not compete with those who have, or girls of Islamic faith whose hibabs become emotional lightning rods, or disabled children who simply want a chance. “Imagine if the world could see what a mom sees,” Is the tagline. The message is universal. And yet…..
All high performance downhill skiers experience injuries and setbacks and American Lindsey Vonn is no exception. The three-time Olympian and 2010 gold medalist in the downhill, has had more than her share: season-ending knee surgery to repair a torn ACL and broken knee bone in early 2013, re-injury of the ACL later in 2013, which kept her off the slopes for all of 2014, including the Sochi Olympics, a broken ankle in August 2015 followed by a knee fracture three months later, ending her season, and finally a broken arm in November of 2016, which required surgery. She returned to the slopes two months later. Prepare: The key to the comeback lies in the consistent, intentional training in advance. Develop personal training routines to keep yourself sharp, strong, and prepared for the next challenge. Internalize the lesson: If you are feeling stuck, reflect on the lessons hidden in the situation. Harness pressure to your advantage: Failure can be scary, but Vonn leverages fear to propel herself forward instead of paralyze her progress. Keep an open mind: Your brain is wired to keep you safe, which is why a setback can trigger stress and strong urge to fight or flee. If you feel stuck and blinded by your current situation, create emotional distance, gain perspective, and see if there are any creative solutions you may have missed. Define yourself: The story that we tell ourselves becomes who we are. Setbacks can be a catalyst for a new self-narrative that holds you back. Visualize: During stressful situations, the mind releases cortisol, which inhibits creativity. Practice mindfulness to quiet the mind and imagine a brighter future. Paint the mental picture with crystal clarity. Keep moving: Approach each situation as an iteration to learn from for the future. From a personal and leadership development perspective, there are a number of nuggets of wisdom here: the importance of a development routine to maintain focus, the ability to see ways to improve when you’re doing poorly and when you’re doing well, facing fear and pressure by visualizing the joy and glory of what is possible. I believe that great leaders, above all else, have an incredible sense of self – one’s strengths, weaknesses, likes and dislikes, and most importantly where one has come from and a clear view of where one wants to go. The more self-aware a person is, the more likely that failure, as she said, will not define you.